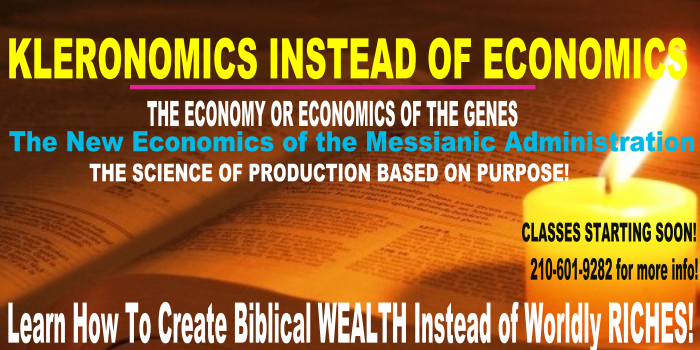 Kleronomics comes from the GREEK word “klēronomos” which means one who receives by lot, an heir, an heir in Messianic usage, one who receives his allotted possession by right of sonship, one who has acquired or obtained the portion allotted to him. Kleronomics is theocentrism! Theo means GOD, centric means CENTERED. klēros is a Greek word meaning; lot, part, inheritance, heritage, portion of the ministry common to the apostles, used of the part which one will have in eternal salvation, of salvation itself, the eternal salvation which God has assigned to the saints, of persons those whose care and oversight has been assigned to one [allotted charge], used of Christian churches, the administration of which falls to the lot of presbyters. klaō is a Greek word meaning; to break, to separate from distractions. What the customer wants, when the customers wants it, how the customer wants and the way the customer wants it. The Customer (GOD) is ALWAYS loved, valued and respected.